Because it has a round nose his shear scraper is mainly used on the inside of bowls. The tool is held with the rounded corner on the rest and tilted at approximately 45 degrees. The rounded corner enables the tool to slide smoothly over the tool rest. It is 3/8 inch wide. 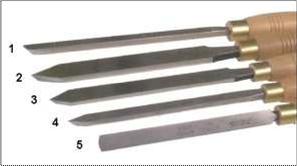 This tool is available in three widths: 1/2 inch (12 mm), 3/4 inch (19 mm) and 1 inch 25 mm). It is used on a convex curve such as the outside of bowls. The long point allows good access betwen outside curve and the foot of the bowl. It is tilted at 45 degrees. The rounded corner allows it to slide smoothly over the tool rest.